At Parklands, we understand that engagement with up to date technology for learning is essential. It forms a vital part of a high quality and relevant education in the 21st century for our students. We believe that students should ideally be able to access digital information, tools and resources from anywhere at any time as they learn in ways that lead to a greater engagement and understanding. To this end, we have included the iPad on the booklist. The versatile and feature packed iPad has the capacity to resolve many of the computing needs of students. The Apple iPad is small, has a long battery life, features software that is educationally valuable, is light and stable and needs little maintenance from highly trained computer specialists. There is no valuable time lost in logging on as the iPad is instantly on when activated. These are all valuable features and the iPad has book-reading capacity that outperforms many far more expensive computers. We do not see the iPad as the solution to all school and student needs. We will still need to support and continue to upgrade many specialist areas. Nevertheless, the iPad should be a brilliant and convenient way of servicing the needs of many users. We feel the iPad has a great future and are enjoying the exploration of how it can add to our learning environment here at Parklands. Each learner is a unique individual with their own needs and background. If a student owns their own device they can have more responsibility for their own learning by choosing Apps and organising their information in a personal way that addresses their own learning needs. This allows them to focus on experiences best for learning from the learners point of view. The responsibility of learning should reside increasingly with the learner (Glaserfield, 1989). Students will also be more likely to take care of a device that is their own and for which there has been personal, financial outlay. Below is a series of frequently asked questions regarding the capabilities of the iPad in education. Please take the time to browse through, as it might cover some of the questions you have been asking yourself. Why should I get an iPad and not a laptop? 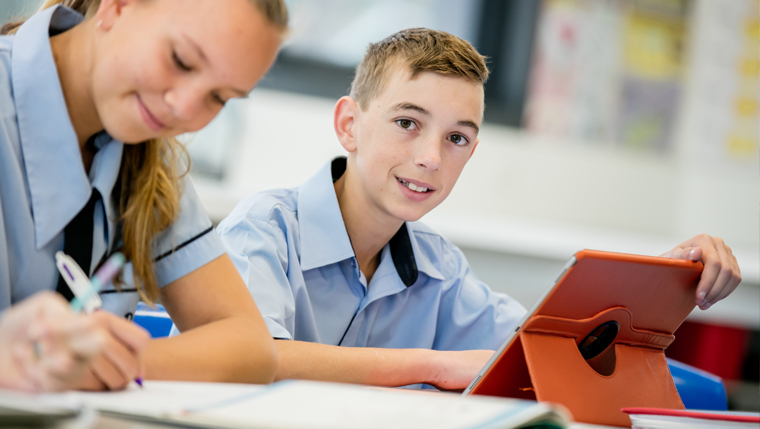 We have considered our unique environment at Parklands and visited schools using both laptops and iPads and believe that the iPad could achieve all that we require in regular class situations. For example, the iPad will access the Internet, School Email and our Google Sites Online Curriculum. It will allow you to Word Process, create Spreadsheets and complete Presentations. The iPad is very light, only 470 grams, and with a battery life in excess of 10 hours, it will last all day on a single charge. You can also run all of the Apps from the Apps Store – these Apps will not run on a laptop. Apple’s walled garden App Store—where applications are fully vetted before being made available to customers—has prevented widespread malware infection of iOS users. As a centralized point of distribution, the App Store provides users with confidence that the apps they download have been tested and validated by Apple. To see our Apps page visit the Apps Information Page. Do I need wireless Internet at home? The iPad is a wireless internet device; we will have ample wireless coverage at school. However there are some things you might consider for home. If you already have wireless internet at home, the iPad will easily connect to this. If you do not have wireless, you can still access iTunes from your PC, and then download Apps to your iPad. Wireless routers are not expensive; you might consider talking to your Internet Provider about options. What sort of Internet Plan do I need at home? It is very important to check what type of Internet Plan you are on. Some plans charge you if you go over your monthly download allowance; others give unlimited downloads and slow your connection down if you go over your monthly limit. The unlimited plans are by far the safest and the best value. We strongly advise checking with your ISP (Internet Service Provider). Why would I need to use eBooks? There are a number of advantages in having books loaded onto the iPad. If for example, we put the Maths book, Science Book, Dictionary, Thesaurus, Atlas, Bible and the odd English novel onto an iPad, we decrease the weight of the school bag by several kilograms. Students will always have access to all those resources in class, and perhaps most importantly eBooks are significantly less expensive than hard copy books. We will also be using eBooks in Years 10-12. You can read these from a laptop, but it is much easier to use an iPad, and the iPad is lighter, and the battery lasts all day. Will reading books off my iPad hurt my eyes? Don’t forget, you will give your eyes a rest between classes, and the iPad can be adjusted for brightness to suit your personal preference. People regularly use the iPad to read newspapers and journals from around the world; many actually prefer the iPad to newspaper print. Will I use my iPad for all my school computing? We envisage that for 90% or more of your time, the iPad will be the device that will meet your needs in the classroom. In specialist areas for example, such as, but not limited to, Music, Visual Art, Maths, Graphics or that use specific software such as, Sibelius and Auto-CAD, the College will provide access to computers that will complete these tasks. We also have a bank of Laptops available for other specialised tasks. At home, for typing up larger English or History essays for example students might use their home PC or Mac, then transfer those files to their iPad to take to school. The advantage of the iPad is that it is light, portable and will last all day on a single battery charge. An iPad has no USB; how do I transfer files? The iPad can plug into (via the supplied USB cable) your home PC or Mac and copy files across. Our experience at school is that students lose USBs, forget to bring them, or sometimes the USB fails and all work on it is lost. Files are actually safer stored “in the cloud” on the Internet. Yes, we have systems in place to allow you to print directly from your iPad. This can be done via the printing option in the app, or you can email the printer a PDF file and it will print it. An iPad can’t open Microsoft Office documents such as Word, Excel or PowerPoint. Wrong, the iPad opens all of those documents. Office 365 is available for iPad, and is free for all current students. You can download these apps from the app store and then register them by signing up at Office.com and register using your college email address. We also welcome the use of other word processing, spreadsheet and presentation apps such as Pages, Google Docs, Sheets, Google Sheets, Keynote and Google Slides. This apps will also allow you to open and save in the Microsoft Office formats. You can’t save to an iPad. Wrong again. Any file you create on an iPad is saved to it. In fact, when you use the Pages word processor it saves every word as you go. The iPad actually has a safer, more regular saving mechanism than most other devices. Can I plug a keyboard into an iPad? Yes you can plug in a keyboard. We have found the built-in screen keyboard works well, especially when you get used to it. However, if you are wanting to type up a large piece on your iPad rather than your home PC, you can buy an iPad keyboard dock, or you can connect a Bluetooth keyboard. Should I get the Wi-Fi-only iPad, or pay more and get the Cellular model? The Wi-Fi-only model would be recommended for a number of reasons. We have spent a deal of time and money putting in place a wireless network throughout the school. Your iPad will connect to this easily, and you will not be charged for any downloads. If you buy the cellular model, not only is it more expensive, you also have to go onto a plan and get a sim card, just as you do for your mobile phone. When you are not connected to a wireless network, the cellular connection will kick in, and your plan will be charged for any downloads. More importantly, with the Wi-Fi-only model, the iPad connects to the Parklands network and passes through all our Internet filters and security. A cellular model can bypass these filters. You can use a Wi-Fi iPad with any wireless hotspot, such as those found at coffee shops, McDonalds, hotels etc. What size should I get, 32, 64, 128 or 256GB? For school purposes, 64GB should be sufficient. However, we suggest you purchase as much memory as you can afford. I have a PC at home, not a Mac; will the iPad work with my PC? The iPad connects to either a Mac or a PC via iTunes. It doesn’t matter what you have at home. The iPad will sync, backup and talk to either PC or Mac desktops or laptops. Have you compared the iPad with other devices? Yes. As part of our pilot program, we compared a number of devices, taking into account the numerous factors relevant to Parklands, including the relative merits of a multi-purpose device compared to a single-purpose device. The comparison therefore paid particular attention to the broad range of educational uses of any proposed device across many subjects within Parklands. Other considerations include classrooms dynamics between students and teachers, the physical layout of Parklands teaching spaces, maintenance needs and cost. Taking all factors into account, the overwhelming support was for the iPad. While other multi-purpose tablet devices have entered the market and can also cater to the learning styles of visual, auditory and kinaesthetic learners, our comparison shows that of the current models, the iPad is currently superior. Do I need to do anything about the safety and security of my child’s iPad? Ensure the iPad comes home every afternoon – it should never be left at school overnight! Yes we have! Cybersafety is already an important part of our ICT curriculum. Every child is introduced to cybersafety in our IT subjects, during our orientation programs and now as a part of our iPad program. For more information about cybersafety visit the CYBER SMART web site. We thank and acknowledge our friends at Northside Christian College for providing much of the above content.